Sidewalks and street art are pretty much synonymous in modern day New York City, but have you ever stopped to question when it all started? 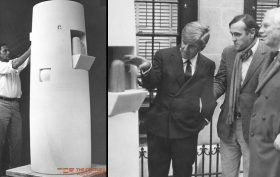 In the winter of 1969, New York City saw the birth of the sidewalk sculpture. While public art in an outdoor setting was not necessarily a new concept, this was the very first time it was situated immediately on the sidewalk. The work was a marble sculpture made by artist Gonzalo Fonseca, commissioned by the Twentieth Century Fund. Upon completion, it stood six feet outside of the organization’s headquarters and weighed a whopping two tons.